Today’s awesomeness began this morning. The overnight light snows left a little bit of a dusting on the shoulder. Not enough to make it slick, but enough to leave tracks. Pretty cool to roll the front tire through it, see it get shiny on the edges, and then watch a steady stream of dirty snow the texture of an Icee keep growing out of the front of the fender. 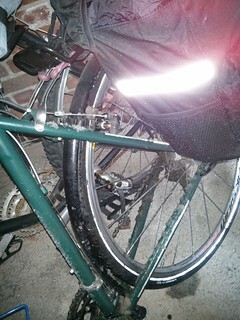 Got to work with the bottom bracket a sloppy mess. Swam at lunch, and tried out a new Jlab Go waterproof MP3 player. Dug swimming with tunes; wish I’d known how to make the player shuffle. Ride home was awesome. The days are getting longer, and it was still twilight leaving the office. Warm (For February) during the day, so the snow was pretty much gone. I had an extra half hour before supper, so I took the long way home, cutting down to Bluff Point and across to Haley Farm as the light faded. There’s a mile-long stretch between Haley Farm and Bluff Point that’s on the ballast for the Acela track. I’m kind of surprised there’s not a Strava segment on it, but also kind of don’t want to make one. It’s flat, flat, and a great stretch for group rides and runs – 5-10 minutes of plenty of room to stretch and talk. By the time I got there, it was actual no-lie dark, and I was enjoying the cold and silence and the tunnel of lights coming off of my handlebars and helmet. The first part of the trail is an abandoned rail bed. Flew around the corner, and almost biffed – caught the front tire in a frozen rut from the ranger’s pickup – three oscillations, and saved it. The cross bike is awesome, but the drop bars aren’t the greatest for manhandling the front wheel around ruts. Plenty of light, but no contrast on the frozen mud. I was happier than a pig in poop. The mud trail comes out onto the ballasted shoulder of the track. Cut the corner and managed not to clip the gate, and briefly sat up to enjoy the spin. About a quarter mile ahead, there was a group of three mountain bikers, so I dropped the hammer and chased until they went up the grade to the pedestrian bridge. Almost caught ’em, ‘cept they could make the sharp turn and rough cutoff. I had to continue on about another 100 feet, slow uturn, and crank up the grade. One little patch of mud on a south facing grade, and I found myself wishing for knobbies instead of the reflective slicks. Kept it upright, cranked over the bridge, and chased the flickering lights through Haley Farm. In hindsight, I think I caught the tail end of the Mystic Cycle Wednesday Ride – bunch of folks with nice bikes putting them up on the cars in the parking lot. Rest of the ride was uneventful – Thought I was going to die going up Fort Hill, but that’s pretty standard. Flanders headed north is the most awesome false flat for about 30 miles around. Flew down the Gold Star Highway, and kind of freaked out when a driver actually slowed up behind me for about 100 yards ’cause they were turning right behind me. Thanks Driver! Somedays, I just love my life.